Player has a region code printed on the back of the unit and only will play commercial DVDs labelled with an identical region cord. Simple, compact & able to playback multiple formats, the Sony DVPSR170B DVD Player is a great addition to any TV in any room of your home. 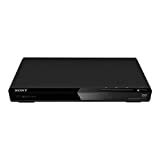 As well as playing your DVD collection the Sony DVPSR170B is able to play Xvid, MP3 & MPEG file recorded on DVDs.